By last Monday, the daffodils were in full bloom. Our readers show their appreciation for our work in a variety of ways, and it always means a lot to our small crew here at the Sun Times. Sometimes it’s a note attached to their subscription renewal. Sometimes it’s a phone call or email. Quite a few stop by our office and let us know they enjoy the work we do. Heidi hadn’t asked for details. Late Thursday afternoon the UPS driver came into the office and said he had a package for me. “Flowers, the box on the bottom,” he told me when I asked what, in the stack of boxes he held, was for me. That was not a box. It was more of a carton; pretty close to a crate. It was huge. When I got the box opened, there were hundreds of fresh-cut flowers. I looked for a note on the flowers, under the flowers, or attached to the box. I snapped a photo of the flowers and messaged it to Heidi via cell phone, then called her. That was when she filled me in that there was 500 daffodils in the box. “What am I supposed to do with them?” I asked Heidi. “They’re a ‘thank you’ gift” from the reader she told me. I knew, though, that soon these flowers would begin to open. Their beauty would be great, but fleeting. I wondered how I could share this gift with people – a lot of people. That was when Heidi hit upon a great idea, she suggested that I take some to the Fairfield Drop-In Center and Front Range Assisted Living. Great idea, but there were 500 daffodils. I went next door and asked Jill and Candy at Fairfield Drug Store if I could bring some flowers over the next morning for them to give away when people came in. The drug store crew said “OK.” Later Thursday afternoon Diane Hausmann stopped by and helped me move the flowers into the unheated back room and cover them with paper towels soaked in water to keep them fresh. When I went home, I worried. This was quite a gift. And, to my mind, it came with a responsibility. It came to me that the best use of this gift was to share it with all of our community. I came in early Friday morning and called our reader. I thanked them for the gift, and asked if it was OK to share the flowers with our community. The anonymous gifter laughed a bit and told me “they’re yours,” and they said they wanted to remain anonymous. It turned out that our subscriber had been reading the Sun Times for about 15 years. They told me that they have a grandson that enjoys the “Hocus-Focus” children’s comic we run each week. (I try to avoid looking at that panel – once I see it, I have to try and solve the mystery (Hocus-Focus can be found on page five)). When I hung up the phone, I typed up a single page note with the title “A Daffodil For You!” to explain to everyone that these were a gift to the community from an anonymous Sun Times reader. I took one of the notes, and flowers, next door to the drug store. I took flowers and a copy of the note to Eagle Grocery and the Fairfield Town Office. I took some across the street to Cozy Corner and the Fairfield Drop-In Center. Some were dropped off at Russell Country Federal Credit Union and Eagle Physical Therapy. I took some to First Bank of Montana. I took some to Fairfield High School and left them with Fran at the office. When Fran asked where the flowers came from, I joked with her and said that it was to make amends for all the grief I had caused my teachers over the years. I left some with Teria Arps at the elementary school. I left some at Front Range Assisted Living. Now, I should mention here that this was not my first time to deliver flowers. When I was a teenager with a driver’s license I would make a little folding money by delivering flowers for Georges’ Florist and Greenhouses in Jackson, Tennessee. We would load up the George’s Florist “Vista Cruiser” station wagon and head out across Jackson and Madison County to make deliveries during the holidays - Easter, Mother’s Day, Valentine’s Day. The extra cash put gas in my Ford Ranchero, which, back then was not a “cool” vehicle for a teenager to drive, but it sure beat tooling around in a forest green Vista Cruiser. After making those Friday deliveries I went back to work here at the office. I buried myself, as usual, into the task of preparing the paper for next week. But I could not shake what had happened earlier. You see, we often hear about “random acts of kindness.” For me, its opening a door for someone. Sure, as a kid I was taught to open the door for “someone older.” But I appreciate it when someone holds a door for me, so I don’t put an age limit on the courtesy. I recall, a few years back, I was delivering the Sun Times in Choteau at Main Street Express. As I approached the door, a young lady – probably a high-school student – held the door for me. As she did, she smiled one of those smiles that just makes your day. And when I stopped for just a second and smiled back and said “THANK YOU!” her smile broadened. That was when I realized something so simple and quick as holding a door for someone can make their day. You see, I had appreciated the gift of daffodils; the “thank you” for our efforts at this paper. But every time I walked into a building with a bunch of flowers in my hand I was able to watch our neighbors smile, too. And they all asked about the flowers. When I told them the story, they loved the story. I drove home on Friday taking a different route to the house. I have no idea why. Maybe I was lost in thought about what a day it had been. Maybe it was fate. As I headed down one of our streets I saw a lady walking to her car, smiling, with some daffodils in her hand. On Saturday, I left my home and headed to Front Range Assisted Living Center. 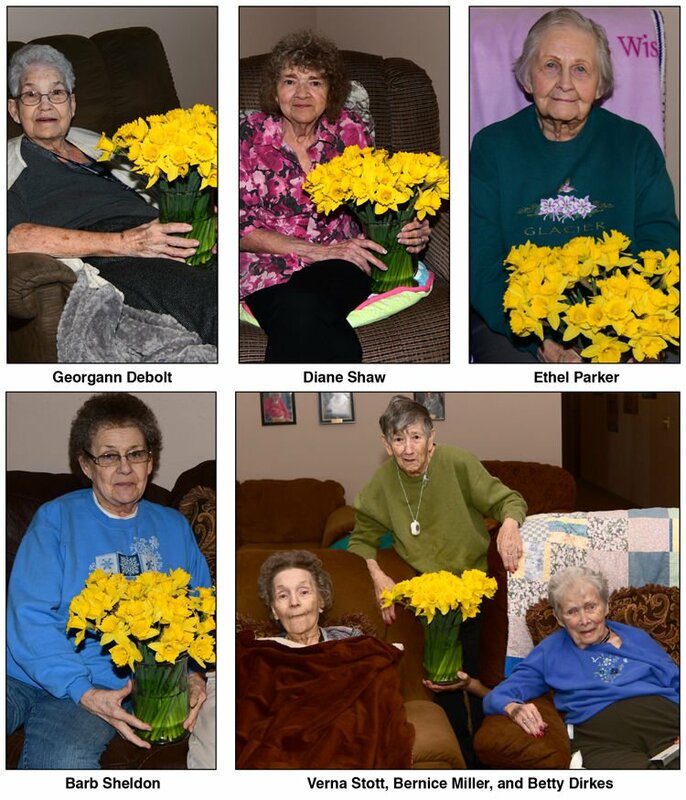 Some of the ladies posed for photos with the flowers I had dropped off.